A few months back Dikembe sent out a tweet instructing critics to refer to their new record as ‘feebleviolence’. Being some kind of critic I thought ‘Okay, I’ll roll with it’, and now that I’ve listened to the bands sophomore record and follow-up to the excellent Broad Shoulders a bunch of times it’s actually a fitting label, even if I’m still not entirely sure what it means. There are times here when Mediumship is on the verge of breaking, moments where it straddles the verge between existence and nonexistence; almost feebly clinging on to the strands of itself it’s cast out. It’s cagey and it’s claustrophobic, only just there. The opening minute or so of Donuts In Six Speed would be one of those moments, you can barely make out vocalist Steven Gray‘s whispers of ‘How much time is too much time?’, and the closing minute of that song juxtaposes the opening, showcasing the livelier aspect of Dikembe’s music, and once the track really kicks in its highly reminiscent of the band’s debut EP Chicago Bowls – it sounds like an updated Scottie Spliffen, splicing and sparkling. It’s undoubtedly the most upbeat Mediumship ever really gets aside from the bounce of the excellent Mad Frustrated, and for the most part Mediumship is fragile, yet thick with a weary melancholy, and even when it seems to be clinging on it’s actually preparing, waiting for exactly the right moment to churn forwards, hiding within itself yet bracing for something bigger – the ‘violence’ aspect. Snakes In My Path simmers with anticipation as melodic guitars flicker, and even when Gray joins in it still sounds reserved, still waiting, and then when it does burst forward it sounds all the better for its build-up, unleashed. This is where Dikembe’s ability as song-writers really shines, they can set up this climax and then just as easily abandon it, as they do on this song, switching the dynamic on a whim, and to an extent Mediumship keeps a listener guessing, and despite using similar song structures (tracks often begin with thirty seconds or so of sprawling instrumentals) and a few tracks sounding similar (Hood Rat Messiah / Snakes In My Path) you’re never quite sure what to expect, and it’s a testament to Dikembe’s quality that you expect to enjoy whatever it is once it rolls around. You can class Mediumship as ‘feebleviolence’ (you probably shouldn’t in case it catches on and we end up in the midst of a revival in ten years) but as is common of the band it toes the lines between a few genres, throwing them into the mix. There’s an emo styling to the lyrics, which are highly poetic and expressive – one of the record’s strongest areas – but in its more abrasive moments Mediumship is indisputably rock and punk music, with songs like Gets Harder and 24 Karats even straying into grunge territory, drawing comparisons to Nirvana. The most blatant comparison throughout Mediumship is how ‘Brand New’ it sounds, and once you notice it the notion’s difficult to shake off. Maybe it’s the occasionally echoing vocals of Gray which often rise to shouts, or the spacious, anticipation-filled verses which explode into passionate intensity; or maybe it’s the strong instrumental focus and group dynamic, but Mediumship sounds like it was recorded between listens to The Devil And God Are Raging Inside Me, and I’m still not entirely sure whether that’s a good or bad thing – although I swing more towards the former with each playthrough. Gets Harder certainly feels like it’s aiming for Sowing Season heights during a brilliant final minute, and there are times when the record seems content to creep along, not doing a whole lot but always doing enough, not quite as dark as The Devil And God, but not far away either. Mediumship is a sombre, grounding listen, and it’s all the more affecting because of Gray’s lyrics, which hit especially hard. There are no lines about drowning babies, but there are plenty of occasions when Gray is up to his neck in metaphorical water, bracing himself for heavy rain and reflecting on life and its lows. Las Vegas Weather ends with the lines ‘I made a bet with the Devil and came to God with a plea / Let’s put our two heads together and make a man out of me and he said “I’m all strung out on miracles, choking on marigolds”’ and they’re a highlight, but Mediumship is packed with lines as good as these, and each song makes a mark, with Gray often shouting the more emotive selections and drawling over the more pensive ones. Second track Hood Rat Messiah finds this balance, and it’s one of the strongest songs, mellow initially before erupting into passionate life as cries of ‘And I can’t find a better way to be’ ring out with unerring honesty amidst crashing, powerful instrumentation, soon relenting to calmer seas without dropping the threat of an approaching tsunami. Despite its Brand New feel Mediumship still feels like a unique, original record, much like 2012’s Broad Shoulders which preceded it. The band opts for a new direction this time around, and even though there’s only been two years between then and now it sounds like Dikembe have aged greatly as musicians. Mediumship is mature in a way that Dikembe have never really been up to this point (see captivating and powerful opener Even Bother), and in a sense it’s a huge progression for the Gainesville four-piece, a beast of a different nature. In other ways it’s a step back, albeit a small one. Compared to the band’s first record it’s a more reserved affair, slower in nature, and as a result it lacks a great deal of energy in that regard. It’s darker, pensive and brooding, and even during its more colourful moments there’s still a thick, apprehensive fog hanging over proceedings. Mediumship is all about the mood created, and from the offset it oozes with atmosphere, dense and almost unsettlingly so whilst never going too far in that regard. There are moments where Mediumship is incredibly soothing and comforting, and other’s where it’s just as haunting, but it’s always expressive in a way which is never overbearing. Emphatic closer Throw Lips mixes these tones, beginning drowsy and world-weary but ending suitably grandiose during a soaring instrumental crescendo as the lines ‘I’ve been sinking the same skin that I floated in on / And drilling holes at the bottom to keep it underneath’ ring out in a fittingly empathetic fashion. 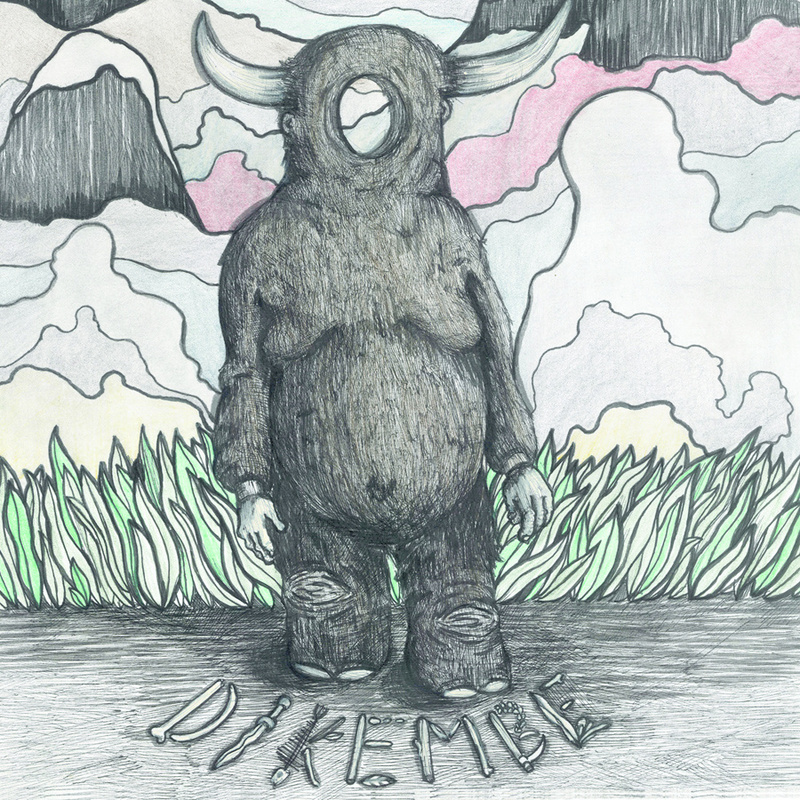 Dikembe have rarely sounded better, and it’s a brilliant culmination to a record which often sounds trapped but frequently sounds just as triumphant amidst its own turbulence. Mediumship grew on me, and continues to do so. After the first listen I was left feeling slightly underwhelmed, not convinced by the softer style, but with each playthrough I felt myself warming to it more, up to the point where I wanted to listen to nothing else; to really immerse myself in the experience for as long as I could stomach. Mediumship is surprisingly welcoming for a record which sounds so isolated, and it’s a result of the mood conjured up throughout, one which is cold but begs for a fire to be lit – and it does frequently spark into life. It leaves its mark, even though it might not do so immediately, and maybe in that sense it is quite a challenging listen, encouraging a listener to sink deep in order to really benefit. It’s better this way, because one you do really begin to experience all that Mediumship has to offer you’ll struggle to pull yourself from of its current.